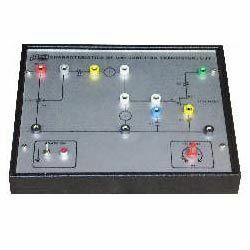 The basic electronics trainer’s we offer are manufactured using qualitative material sourced form reliable vendors. These basic electronics trainers have gained huge appreciation from the students across the globe for their excellent features. Characteristics of Semiconductor Diodes is a versatile and well - designed self - contained trainer kit. It is a useful training tool for the teacher and the students for basic electronics. 4 Determination of Vknee , static and dynamic resistance from graph. 4 Comparison of characteristics of germanium and silicon diodes. 4 Completely self contained stand - alone unit. 4 Built - in germanium diode, silicon diode and other necessary components. 4 Built - in DC regulated variable power supply with short circuit protection of 0 - 12 V.
4 Mains ON / OFF switch with LED indicator for supply “ON”. 4 Multicoloured sturdy 4mm test points are provided at various stages in the circuit to observe the waveforms and voltages and for necessary inter connections. 4 Provision for connecting external voltmeter / current meter as per requirement. 4 Housed in an elegant ergonomically designed powder coated metal cabinet with a well spread intelligently designed circuit layout on the front panel. 4 Working on 230V, 50Hz, single phase AC mains. 3 Quantity : 03 numbers provided. 3 Quantity : 01 number provided. 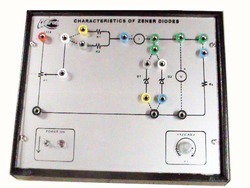 Characteristics of Zener Diodes is a versatile and well - designed self - contained trainer kit. It is a useful training tool for the teacher and the students for basic electronics. 4 Study, perform, demonstrate and plot the V - I forward and reverse bias ( breakdown ) characteristics of two zener diodes of different values. 4 Comparison of characteristics of the two zener diodes of different values. 4 Investigate zener diode’s unique application as a voltage regulator. 4 Built - in two zener diodes of different values, load resistor and other necessary components. 4 Multi - coloured sturdy 4mm test points are provided at various stages in the circuit to observe the waveforms, voltages and for necessary inter connections. 3 Quantity : 05 numbers provided. 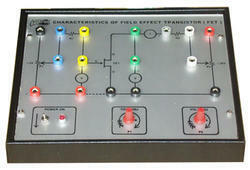 Characteristics of Uni - Junction Transistor ( UJT ) is a versatile and well - designed self - contained trainer kit. It is a useful training tool for the teacher and the students for basic electronics. F Intrinsic stand - off ratio ( Õ ). F Peak point emitter voltage ( Vp ). F Peak point emitter current ( Ip ). F Valley point emitter voltage ( Vv ). F Valley point emitter current ( Iv ). 4 Comparison of characteristics of different modes. 4 Investigate UJT’s unique application as a relaxation oscillator and observe the saw tooth & pulse waveforms. 4 Completely self - contained stand - alone unit. 4 Built - in p - channel UJT and other necessary components. F 0 - 12V ( Variable ). F 12V ( Fixed ). F Quantity : 02 numbers provided. F Quantity : 01 number provided. Since the inception of our company, we are engaged in manufacturing the premium quality of Transistor Trainer Kit. The offered transistor trainer kit is used as a training tool for studying basic electronics in colleges. Owing to its in-built circuits and isolated DC power supply, the offered transistor trainer kit is highly demanded. Common Base Mode (Dedicated circuit for each mode). To plot various graphs for above modes and determination of Vknee from graph. 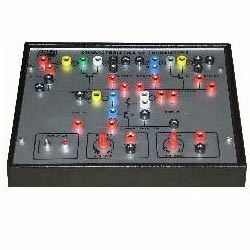 Built-in dedicated circuit for each mode with transistors and other necessary components. Built-in two isolated DC regulated variable power supplies with short circuit protection of 0-12V each. Mains ON/OFF switch with LED indicator for supply “ON”. voltages and for necessary inter connections. Provision for connecting external volt meter/current meter as per requirement. designed circuit layout on the front panel. Working on 230V, 50Hz, single phase AC mains. As a noteworthy entity of this domain, we manufacture and supply the optimum quality of Programmable UJT. To demonstrate and study the characteristics of a p-channel uni-junction transistor (UJT), the offered products are used. To ensure a defect-free range, the offered UJT is checked on various quality assurance procedures. Study, perform, demonstrate and plot the v-i characteristics of a p-channel uni-junction transistor (ujt). Known as a reliable manufacturer and supplier, we have been able to offer the finest quality of Triac Trainer Kit. The study and demonstration of various characteristics of bi-directional triode is done by using the offered triac trainer kit. In addition to this, the offered triac trainer kit is available with us at cost effective prices. Study, perform, demonstrate and plot the different characteristics of a bi-directional triode (triac) under different gate current conditions for. forward break over voltage (vfbo). reverse break over voltage (vrbo). negative resistance region, vbo symmetry and delta v (v). Built-in triac and other necessary components. Provision for connecting external voltmeter/current meter as per requirement. 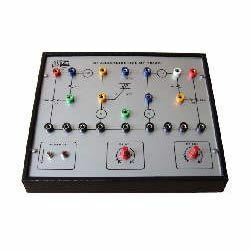 Characteristics of Diode and Zener Diode is a versatile and well - designed self - contained trainer kit. It is a useful training tool for the teacher and the students for basic electronics. 4 Comparison of characteristics of a silicon diode and zener diode. 4 Completely self - contained stand alone unit. 4 Built - in silicon diode and zener diode, load resistor and other necessary components. 4 Built - in DC regulated variable power supply with short circuit protection of 0 - 12V. 4 Provision for connecting external volt meter / current meter as per requirement. Looking for Basic Electronics Trainers ?